Nobel Prize winning physicist. 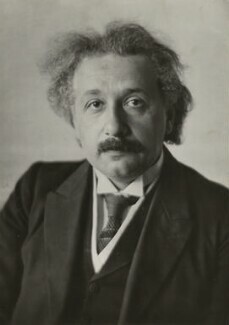 Einstein achieved world fame by his theories of Relativity (1905 and 1916). In June 1921, Einstein came to London at the invitation of Viscount Haldane to deliver an important lecture on his theories of Relativity. Haldane was one of the few leading politicians of the day to have a real understanding of the philosophical significance of Einstein's work. 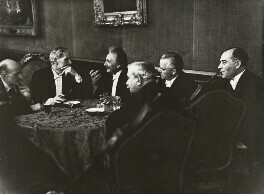 Einstein's visit captured the public imagination and The Sphere (18 June 1921) reproduced Benington's informal double portrait of Einstein and Haldane as its front cover with an inset of Einstein taken at the same sitting.